mxODBC™ is the eGenix flagship product for connecting Python to all major databases, on all major platforms, using a fully Python DB-API 2.0 standard compatible ODBC interface, with many extensions and enhanced support of stored procedures with input, output and input/output parameters. 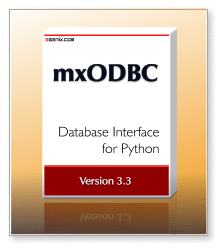 mxODBC™ provides an easy to use, high-performance, reliable and robust Python interface to ODBC compatible databases such as MS SQL Server, Oracle Database, IBM DB2, Informix and Netezza, SAP Sybase ASE and Sybase Anywhere, Teradata, MySQL, MariaDB, PostgreSQL, SAP MaxDB and many more. It is an extension to our open-source eGenix.com mx Base Distribution. ODBC refers to Open Database Connectivity and is the industry standard API for connecting applications to databases. In order to facilitate setting up ODBC connectivity, operating systems typically provide ODBC Managers which help set up the ODBC drivers and manage the binding of the applications against these drivers. On Windows the ODBC Data Source Manager is built into the system. On Mac OS X, the iODBC ODBC Manager is part of the OS, with an optional ODBC manager GUI available as separate download. On Unix platforms, you can choose one of the ODBC managers unixODBC, iODBC or DataDirect, which provide the same ODBC functionality on most Unix systems. If you are looking for a platform independent remote database connectivity solution for Python, you may be interested in our mxODBC Connect product, which eliminates the need to have an ODBC driver for the client side of the application. It specializes on remote database connections such as the ones you typically find in web-applications, e.g. where multiple Linux servers need to communicate with a company database running on a Windows server. Python Database API 2.0 Compliance: the mxODBC API is fully Python DB-API 2.0 (PEP 249) compatible and implements a large number of powerful extensions. Support for all popular ODBC Drivers: mxODBC includes adjustments and work-arounds to support MS SQL Server Native Client (both on Windows and Linux), MS SQL Server Native Client ODBC Driver, FreeTDS ODBC Driver, Oracle Instant Client ODBC Driver, IBM DB2 ODBC Driver, Sybase ASE ODBC Driver, Netezza ODBC Driver, Teradata ODBC Driver, PostgreSQL ODBC Driver, MySQL ODBC Driver, MariaDB ODBC Driver, MaxDB ODBC Driver as well as the ODBC driver sets of EasySoft, DataDirect, OpenLink, Actual Technologies. Stable, robust and reliable: the mxODBC API has been in active production use for more than 15 years. Support for custom Row objects: in addition to using standard Python tuples, mxODBC can automatically return result set rows as custom objects. mxODBC comes with a set of optimized row factories for: TupleRows, ListRows and NamespaceRows. All of these provide both index and attribute access to row column fields - much like namedtuples in Python. Support for ODBC direct execution: have mxODBC send the queries and parameters directly to the database server instead of letting the ODBC driver parse them on the client. This can in some cases result in much better performance and provide more feature richness for your applications. Support for all ODBC Transaction Isolation Levels: use mxODBC to adjust the isolation level to meet your needs and requirements, optimizing database access the way you need it. ODBC and Oracle style parameters: mxODBC can be used with both the standard question mark ODBC style parameter syntax (e.g. "... where id=?") as well as with the Oracle style named parameters (e.g. "... where id=:id"). connection.dbapi to have the right module level mxODBC objects readily available without having to import them separately. Easy installation: using pip/easy_install/zc.buildout and our web installer from PyPI, or using our Windows installers, Python distutils compatible prebuilt Python packages or setuptools/zc.buildout/pip compatible egg packages. Commercially support available: eGenix provides commercial support for this Python extension, so you can be sure that your questions and issues will be addressed promptly. Linux systems usually come with at least one of these ODBC managers pre-installed. Please see the mxODBC User Manual for setup instructions. It is also possible to use the DataDirect ODBC manager on Linux systems, if needed, or recommended by your database vendor. On other systems, you can use our mxODBC Connect product to connect to your databases from Python. Unlike mxODBC, the mxODBC Connect product does not need ODBC drivers on the client side. Only the server needs an ODBC driver installed and this is typically run directly on the database server, giving you much better performance and more stability for your applications. mxODBC licenses are available in different editions to meet your specific needs. The edition features are enabled via the license files that you receive after purchase. The download packages are the same for all editions. The Professional Edition License allows installation of mxODBC for use in one Python installation. There is no limitation on the database backend, the number of open connections per process, or the platform - you can benefit from the full mxODBC functionality on all supported platforms. This edition is ideal for users in professional settings and in situations where the number of connections should not be limited, e.g. in a web server environment. If you are intending to upgrade from an existing mxODBC license to the new mxODBC 3.3, please contact the eGenix.com Sales Team with your existing license serials for details for an upgrade discount coupon. We will give out 20% discount coupons for upgrade purchases going from mxODBC 2.x to 3.3 and 50% coupons for upgrades from mxODBC 3.x to 3.3. After upgrade, use of the original license from which you upgraded is no longer permitted. If you want to redistribute mxODBC as part of a product on a per-installation basis (rather than on a per developer and product basis), you can do so by purchasing standard or professional edition licenses in bulk and then redistribute these to your customers. For larger volumes we also have a special reseller agreement to simplify the process. Please write to the eGenix.com Sales Team for instructions and more information. The manual includes a comprehensive installation guide, a discussion of the design principles behind mxODBC, as well as a reference of the available programming interfaces. With over 200 pages it provides a very detailed overview of the many professional features in mxODBC. Before continuing with the download of mxODBC, first make sure that you have installed the eGenix.com mx Base Distribution (version 3.2 or later), since the eGenix.com mxODBC Distribution is an add-on to our base set of Python extensions. We have successfully tested mxODBC with iODBC 3.52.7 and unixODBC 2.3.2. With the MSI installer you also have the option to run the installer without the GUI or to integrate it into an automatic installation process. Please see the MSI installer documentation on the Python web-site for details. Several of these have integrated mxODBC into their products, e.g. InfoSeek in the UltraSeek enterprise search engine, which was later sold to Inktomi, Verity, Autonomy and then HP.